↑ Company shares went down by $ 0.4 a share but with the re-invested dividends number of shares went up from 271 to 275. Overall value went up by $70. 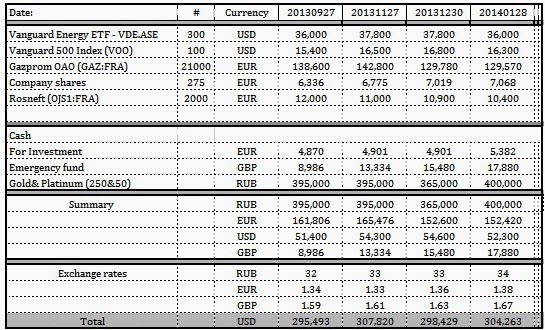 ↑ EUR and GBP are up to USD, for me it means $2,339 USD for EUR and 620 for GBP. ↑ accumulated $4,000 as part of my annual savings goal. ↑ Vanguard SPF 500 ETF 82 USD after paying 10% tax. - Currency diversification is certainly at work, making the portfolio less volatile. - Vanguard ETF dividends were about 1.5% even now, at very favorable oil prices. It is not very inspiring. Same applies to Vanguard 500 Index at 2% annual dividend rate. - My bank is getting greedy, from this year to maintain account will cost me $150 and 0.08% of the portfolio. Every transaction cost $10 and 0.1% of its cost. In other words should I want liquidate my portfolio tomorrow it will cost me $305 before I could access the money. Annual cost to keep the account is $350. - I have never felt myself so poor in my entire life, even when was very young and had nothing in my pockets, but then there was a promise of tomorrow. Getting mature I have came to realize that if I will stay on the track it take me next 30 years to build nest egg big enough to support me during retirement. Just maybe lucky enough to leave something behind for the kids. This is a reality check.